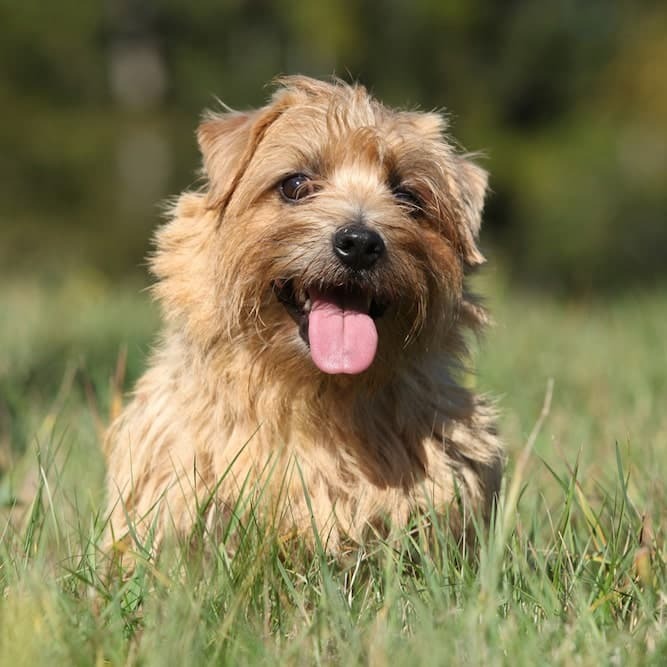 Fearless, fun, and feisty—these are a few characteristics that describe the Norfolk Terrier temperament! Norfolk Terriers are intelligent and active little dogs. They are a perfect choice for anyone who is looking for a big personality in a pint-sized package. These adorable, scruffy canines generally weigh no more than 11 or 12 pounds. There is nothing more exciting than the idea of bringing home a brand new Norfolk Terrier puppy or giving a loving home to a rescued Norfolk Terrier. 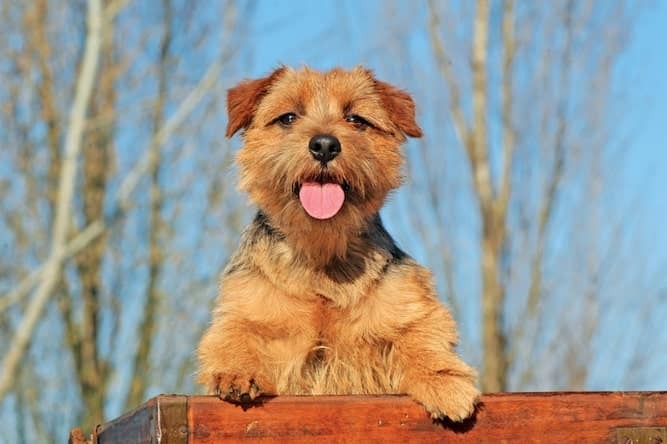 However, the Norfolk Terrier temperament is not for everyone, so let’s take a closer look at the personality traits of this breed. It is crucial to get to know the attributes of this unique dog before adding one to your family. Understanding the history of the Norfolk Terrier will help you gain a better understanding of your dog’s temperament and training needs. Norfolk Terriers were bred to hunt rats, foxes, and other vermin. The breed originated in England in the early 1900s. Older terrier breeds such as the Cairn Terrier and the Border Terrier are thought to be ancestors of the modern Norfolk Terrier. Norfolk Terriers were originally grouped together with their close relatives, the Norwich Terriers. However, in 1979 the American Kennel Club recognized them as two distinct breeds. The two breeds remain similar in appearance but can be differentiated by their ears. The Norfolk Terrier’s ears flop over while the Norwich Terrier’s ears stand erect. Norfolk Terriers may be small, but they were bred for a purpose. Norfolks were not developed to be lap companions like other small breeds. These dogs were bred to patrol the outbuildings of farms—sometimes in snow, rain or oppressive heat. Therefore, Norfolk Terrier breeders created a hardy, rugged breed with a strong drive to work. Norfolk Terriers sometimes hunted in packs with other dogs, and they usually worked independently from their masters. 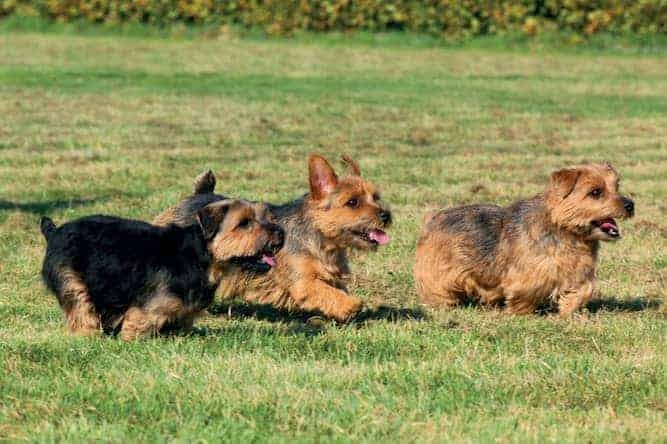 Unlike herding dogs or sporting dogs that waited for their owner’s commands, Norfolk Terriers often carried out their work without human supervision. This explains why many Norfolk Terrier owners describe their dog's temperament as clever, independent, and occasionally stubborn! These dogs have a long history of making their own decisions. 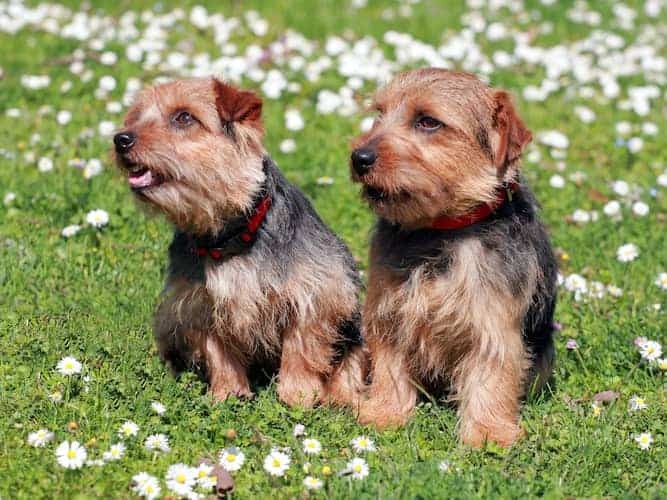 Norfolk Terriers are active and energetic. If you add a Norfolk Terrier to your family, you should expect to provide it with plenty of physical exercises and mental stimulation. These are intelligent and inquisitive creatures. They are eager to investigate new people, places and things. And they rarely hang back and observe; rather, they usually approach new situations in a bold manner. Norfolk Terriers can make wonderful companions for children but you must socialize them properly. They can also do well with other dogs with early socialization, although they can sometimes be scrappy with dogs that they do not know. Since Norfolk Terriers were bred to hunt small mammals, they should not be trusted unsupervised around small pets such as rabbits, hamsters, or ferrets. Norfolk Terriers are loyal and sensitive dogs. They bond deeply to their families and they will protect them against any perceived threats. Norfolk Terriers are highly intelligent but they have an independent streak that can make training a challenge. They are extremely alert and can be easily distracted by outside stimuli, so keep training sessions short and positive. You will need to find a reward that is highly motivating to your Norfolk Terrier. A high-value food reward such as chicken or roast beef should do the trick, just be sure to use very small pieces. You will get the best results if you follow the tenants of positive reinforcement dog training. This type of training uses rewards to identify and strengthen good behavior. It uses redirection and time-outs to decrease the frequency of unwanted behaviors. It is the safest, most effective and most humane method of dog training because it avoids the use of physical reprimands and fear. Never use harsh punishment to train your Norfolk Terrier. This will damage your relationship with your dog. Once your Norfolk Terrier has mastered the basics, be sure to check out the fun world of canine sports! Norfolk Terriers can be fierce competitors in EarthDog trials, Agility, Rally Obedience, and more! Norfolk Terriers have particular needs in terms of grooming, nutrition, and health. Let’s take a closer look at what you will need to know in order to take care of your Norfolk Terrier. 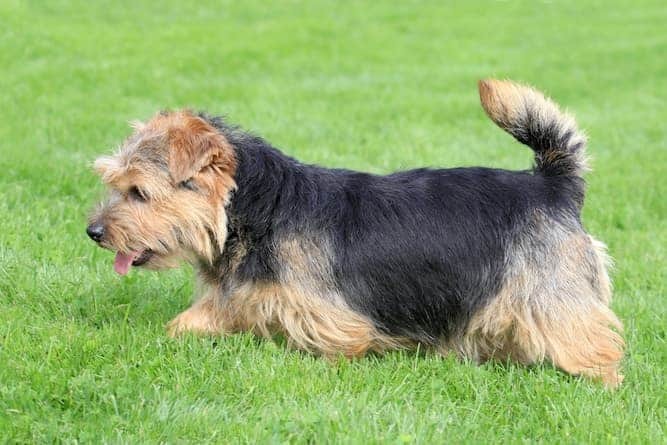 Norfolk Terriers have a course, wiry outer coat, and a soft undercoat. This distinctive coat requires occasional hand-stripping to maintain its shine. You will need to learn the technique of hand-stripping or find a professional groomer that can provide this service a few times per year. A high-quality diet is crucial for keeping your Norfolk Terrier at a healthy weight. This breed can be prone to obesity, so consult your veterinarian about the best brands and feeding schedule for your Norfolk Terrier. With good care, Norfolk Terriers can live to be 12-16-years-old. Note: The best cure for health problems is prevention. The Ultimate Guide to Dog Health will set you on the path to ensure your Norfolk Terrier maximizes its lifespan. If you decide to add a Norfolk Terrier to your family, you have many options of where to find your perfect match. There are already so many homeless animals in this country. Adopting a Norfolk Terrier is a wonderful way to add to your family while giving a home to a dog in need. Visit your local animal shelter and/or humane society and tell the adoption staff that you are looking for a Norfolk Terrier. Ask if you can add your name to a waiting list or put an application on file. Let them know if you are open to meeting Norfolk Terrier mixes or other terrier mixes. Peruse Petfinder and AdoptaPet. These are national adoption websites that will allow you to search by breed and location. They will even allow you to set alerts so that you will be notified as soon as a Norfolk Terrier becomes available for adoption near you. Another useful adoption website is Get Your Pet. This is a rehoming website that allows owners to rehome their pets directly to new homes without relinquishing them to a shelter. There is even a rescue group (Norfolk Terrier Club) that specializes and dedicates its efforts specifically to Norfolk Terriers. They are a non-profit organization of volunteers and foster families around the United States. The cost of adoption varies depending on the organization. Animal shelters and humane societies generally ask for an adoption fee of $75 – $150. Private rescue groups may ask for a higher donation. When you choose to adopt, your new pet usually comes spayed/neutered, vaccinated, and vetted. 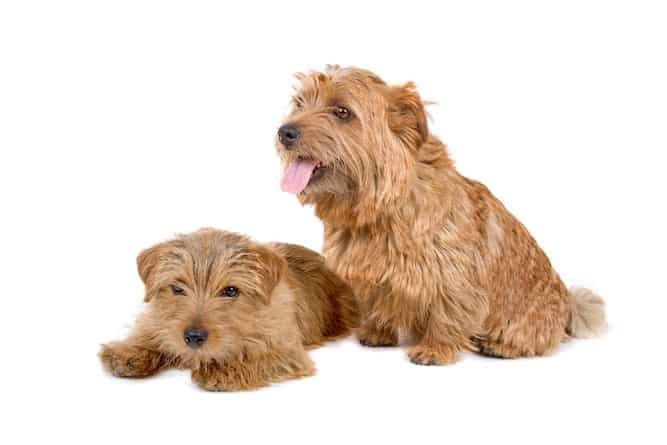 If you choose to purchase a Norfolk Terrier puppy from a breeder, expect to put in the time and effort to ensure that your new puppy comes from a reputable Norfolk Terrier breeder. It can be difficult to find a responsible breeder, but it is worth the extra effort to make sure that you are not unwittingly supporting an unscrupulous breeder or puppy mill. A good way to start is to contact the Norfolk Terrier Club and ask for referrals of Norfolk Terrier breeders in your region. Once you identify a promising breeder, make sure you visit the property and ask to see medical records for the breeding dogs. Also, ask to meet some of the dogs on site to gauge their temperaments and make sure they are true to breed. The breeder will ask you questions, too. They want to make sure that their puppy is going to a good home. They will likely require you to sign a contract agreeing to spay or neuter your pup at the appropriate age. You will also have to promise to return the puppy to the breeder if things do not work out. These are all signs of a responsible breeder. If the breeder does not ask for these things and/or does not want you to visit the property, these are red flags. Never purchase a puppy from a pet store or over the internet. Many of these puppies come from puppy mills or puppy farms. The breeding dogs at these facilities are usually in abysmal conditions. The puppies that come from these operations are frequently sick and riddled with genetic abnormalities due to poor breeding practices. If you purchase one of these puppies you may end up with a dog that is plagued with medical problems for life. Just because a puppy is “AKC Registered” does not guarantee that it is from a reputable breeder. Again, do your research, ask questions and visit the breeder in person to assess the puppies' environment. Prepare to pay a higher fee. You can expect to pay between $2,000-$4,000 for a Norfolk Terrier puppy from a high-quality breeder. Some breeders may have adult dogs that are available for less. 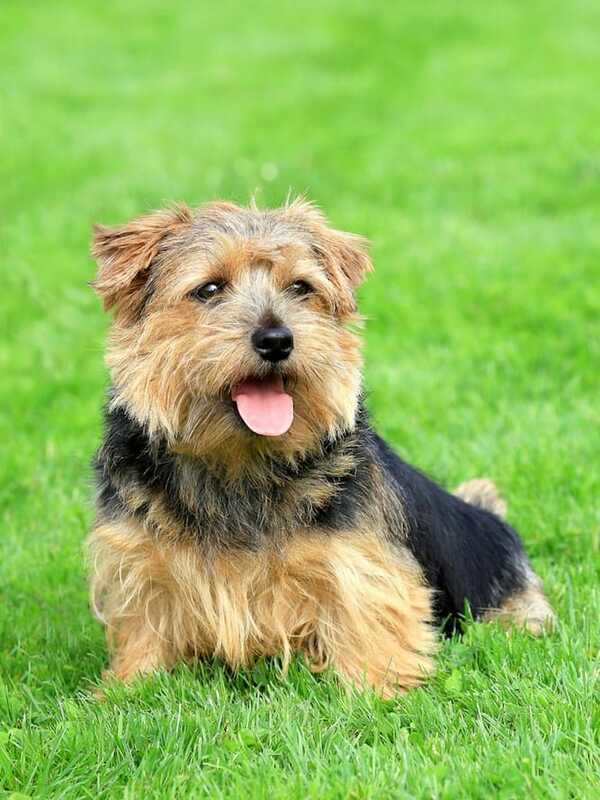 If you are looking for a robust and lively little companion, the Norfolk Terrier might be the perfect match for you! Just be sure to do your due diligence to make sure that you prepare to provide your Norfolk Terrier with everything it needs for a long and happy life! Previous post: Irish Water Spaniel Temperament: Ready for A Curious, Intelligent, Clown?